Turkish women liked jewelry very much and wore them from ancient time. Zargar (jeweler) was famous profession, but his work was very difficult. Master had to have a sense of colors, special taste and feel the beauty of nature. The jewelry of XIX century was very rich and could have different forms and colors. They were used for headdress and outerwear decoration. There were special schools of jewelers in Surkhandaria, Bukhara, Khorezm, Fergana and Tashkent. At that time jewelry was very diverse. Turkish women wore chains, hanging caskets, brooches and small flacons on the chest and neck. To hairs women attached elegant pendants with gold and silver coins. Diadems and crowns were put on head. The main jewelry was earrings that manufactured in wide range. They could be short, in crescent form, with gems and others. Women’s wrists were decorated by wristlets that can be with snake head, in form of almonds or moufflon horn. Jewelry was often made with corals, pearls and gems. In each region masters used their own methods and styles. Jewelry decorated by small beads was very famous in Surkhandaria and Kashkadaria. But Tashkent women liked to wear jewelry with emeralds, pearls and small glasses. 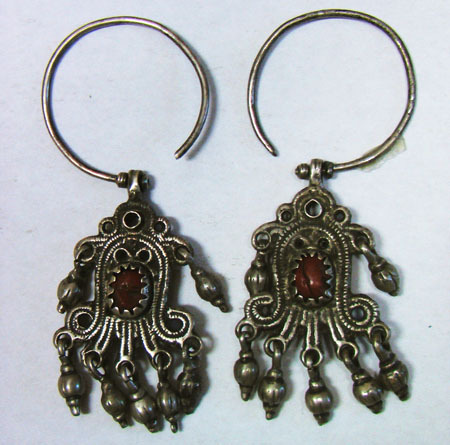 Bukhara women wore earrings decorated with big garnet or pearls. Jewelry was usually made by requests. Wealthy people ordered jewelry form gold and silver decorated with gems and pearls. Poor people wore gold plated jewelry or made from copper or German silver.